This document comes in two versions – English and Chinese. It is between two individuals who set up a limited company to run a new business in which each of them has 50% of the shares. This basic Agreement is designed for use between two individuals who decide to form a limited company for a new business venture in which each of them will own 50% of the shares. The agreement assumes that the company to be formed will be incorporated in England. If the company is formed in another country, some of the wording may not be appropriate and changes may be needed. Note: There are quite a few details to be inserted in the text and many of these are identified by square brackets [ ]. While all the wording should be checked for suitability, wording in square brackets is optional/variable and the square brackets should be removed before the agreement is finalised. The Agreement, after a short clause defining certain terms, sets out the principal objectives of the business and the initial share capital to be contributed by each of the parties in Clause 3. So far as share capital is concerned, advice from accountants as well as lawyers may be appropriate: for example, if initial capital of £10,000 is required, it might be advantageous to have only £1,000 as share capital with the remaining £9,000 contributed by way of loans from the Shareholders to the Company. If such an approach is adopted, then the wording would need to be changed to accommodate this. Terms upon which the loans would be repayable and the interest, if any, it would earn, would also need to be specified in the Agreement. 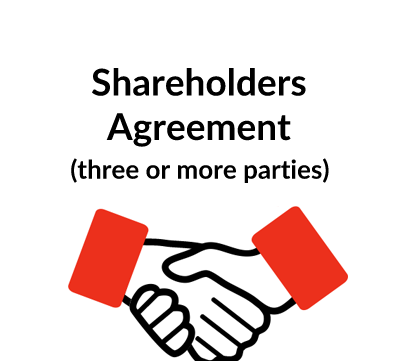 Clauses 3.3 and 3.4 deal with additional capital and 3.5 makes it clear that if any guarantees are required from the Shareholders, they should be provided pro rata – i.e. each of them will guarantee 50% of the liability. Bear in mind, however, that the third party bank or other lender requiring the guarantee may want the right to pursue either guarantor for 100% of the debt (“Joint and Several Liability” as it is referred to in legal documents). Careful negotiation and legal advice is going to be required in such circumstances. Clause 4 sets out the profits policy – namely a commercial approach with a view to maximising distributable profits. Clause 5 deals with the appointment of officers – the Directors and Company Secretary. Where there are two individual Shareholders, the most likely scenario is that each of them will be a Director and one of them will become Chairman, probably without a casting vote. Sometimes Shareholders agree to the Chairmanship being rotated. Alternatively the Shareholders may decide not to have a chairman, in which case the clauses referring to the chairman can be removed. The Company Secretary can be one of the Directors, but it may be an accountant or solicitor or some other third party suitably qualified. Clause 6 deals with the arrangements for meetings of the Directors. The most important provision here is 6.4. What happens when the Directors do not agree on a particular course of action? One solution is to give the Chairman a casting vote but that is unlikely to be acceptable with two equal Shareholders. If there is a real disagreement, what is termed a “Deadlock”, then the procedures in Clause 15 may have to be operated if this clause is included. At the end of the day, if the Shareholders in a company such as this cannot reach agreement, the only solution is either for one to buy out the other or for the Company to be wound up. Hopefully that will not happen but the risks need to be considered. That is one reason for having a Shareholders Agreement, so that there is a procedure for dealing with difficulties should they arise. Clause 7 deals with routine day to day management. If one of the Shareholders/Directors is to be running the business then this would need to be covered here. Similarly, if the two Directors have already agreed on some third party to act as manager, that can be recorded accordingly. Clauses 7.2 and 7.3 deal with some financial issues – it is sensible to resolve such matters before the Company is set up rather than fall into a deadlock at the first meeting of the Directors. Clause 8. It is usual to name the Company’s bank in the Shareholders Agreement and the arrangements for signing cheques. Clause 9 deals with formal matters, namely the appointment of accountants and the address of the registered office – i.e. the official address – of the Company. This is frequently the address of the solicitors or accountants who are involved in setting up the Company. On the other hand, it could be where the head office in reality is or perhaps the home of one of the Shareholders, if it is a small operation. Clause 10 lists matters which require the consent of both Shareholders and the clause is so drafted that it should cover not only decisions at Shareholder meetings, but also decisions of the Shareholders or their nominees acting as Directors. Where each Shareholder has 50% of the shares and they are the only two Directors, the consent of both of them is required in any event before any decision can be made – unless the chairman has a casting vote. The precise list of items in this clause is obviously a matter for agreement. As drafted, the list covers some of the more important financial commitments that a company might consider entering into. 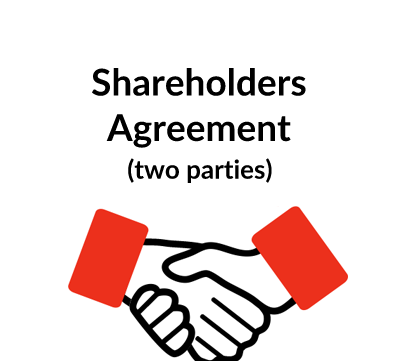 Clause 11 is designed to prevent a Shareholder from allowing any third party to acquire an interest in the Company without the other Shareholder’s consent. There is an exception in 11.2 for a family company but this needs to be handled with some care and certainly with legal advice, otherwise the family company might, itself, be sold on and the other Shareholder may find himself with a partner that he never contemplated and did not want. Clause 12 is designed to reinforce the other provisions of the Agreement and to make sure that the Shareholders act in an honest and fair way towards one another and towards the Company. Clause 13 restricts the Shareholders from having an interest in a competing business. Whether or not this is appropriate will depend upon the circumstances. Clause 14 deals with the situation whether one of the Shareholders become bankrupt or commits some serious breach of the Agreement – the solution being that the other Shareholder can buy him/her out at a price fixed by the accountants. Sometimes Shareholders wish to specify the way in which the share price should be calculated, in which case the method of calculation would need to be spelled out in the Agreement. Clause 15 deals with the procedure if there is a serious deadlock between the Shareholders on the way in which the business should be run. In essence it is a three stage process. Fist of all, the deadlock is identified and a statement is issued by one Shareholder to the other stating his/her position. Clause 15.3 allows the matter to be referred to mediation if both Shareholders agree. If this fails and the business is effectively paralysed, then the solution is for one of the Shareholders to give notice either to buy the other’s shares or to sell his/her shares to that other Shareholder at a fair price which will be fixed by the accountants if not agreed. If that procedure is objected to, then both Shareholders are obliged to call a meeting and wind up the Company. The remaining clauses are of a relatively routine nature – with the possible exception of 17.3 which deals with the possibility of one Shareholder dying; the survivor has the right to buy out the deceased Shareholder’s shares at a price fixed by the accountants. Clause 18 contains choices with regard to language, law and resolution of disputes. As this agreement was written as an agreement between shareholders in an English company, the language clause may not be needed, and it is recommended that the governing law should be English law. 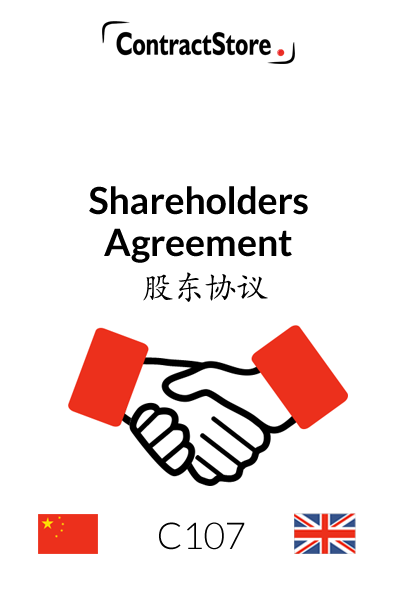 However, if the shareholders in the company are Chinese, then some of the alternative wording may be considered appropriate. Legal advice is recommended in any event.